Why Plinth beams are used? Why Ground Beam is Provided? 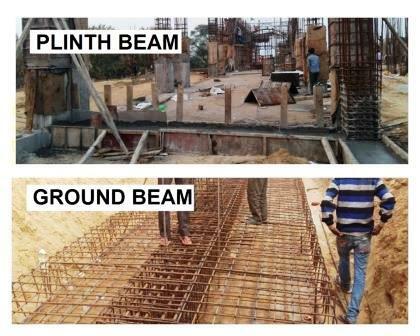 Plinth beam is a beam in a framed structure provided at ground level. It also known as a tie beam because it binds the column. So it reduces the length of column and slenderness ratio. It may not carry any slab load and designed to carry its own self weight and masonry load above the plinth beam. The plinth beam needs to be strong, but need not to be made up of reinforced cement concrete (RCC) all the time. It provides additional stability in regard to settlements of the building and earthquake damages. To maintain the plinth plane proper. To connect all the columns if depth of foundation is high. To avoid difficulties in construction of walls. A ground beam is constructed at foundation level. It support the wall or joist, if the soil sub grade have poor bearing capacity. It is mainly Reinforced Cement Concrete Beam. To prevent settlement of wall. It indirectly increase the bearing capacity.